Chong Xi Ramen is almost 1 year old now, focusing on chicken-infused ramen, located near XiaoNanMen MRT station. There are only 6 seats inside, so you may have to be prepared to wait, but I do feel like it is worth it. So we arrived shortly after opening, therefore were able to get one of only 10 bowls made of the 3rd one on the list: 扇玉珧海老雞湯老麵 – Seafood ramen bowl priced at $380. We also ordered another ramen bowl and a couple of sides. An important thing to note: You can choose if you’d like your noodles cooked to a more al dente level – 遍硬, or if you’d like a softer noodle – Q彈. Just look at that layer of thick chicken oil goodness on the top of this bowl. Yes, some may think it’s disgusting, but fans of the recent Netflix series ‘Ugly Delicious’ will get where I am coming from with this one. The chicken soup is cooked for 8 hours, yes, 8 hours! 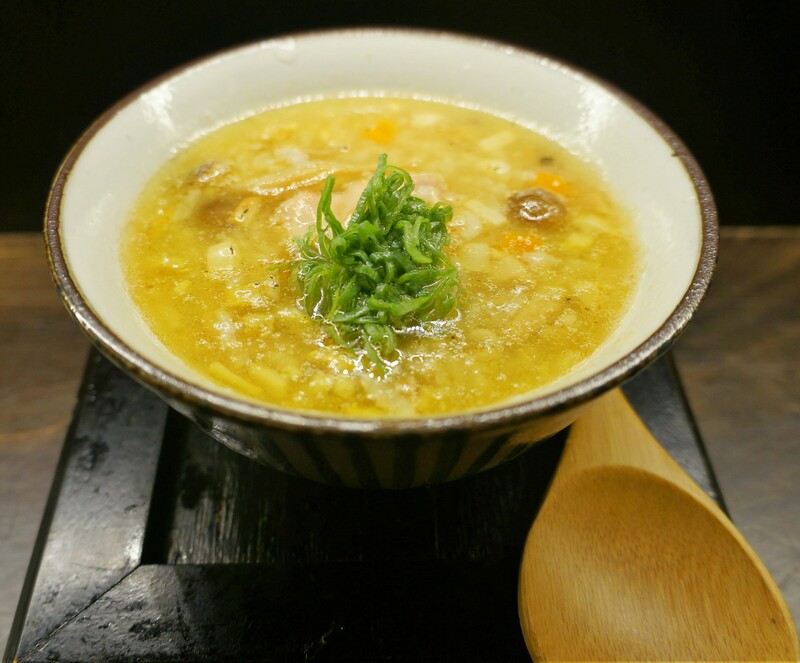 Thick, luxurious chicken soup holds rice and an assortment of sweet corn and earthy mushroom to create this delicate and delicious bowl. We bought this as an accompaniment because we really wanted to try the ramen dishes that this place is known for. But, this could be a meal in its own right with some side dishes (of course). The vegetables presented were 龍鬚菜 with a sesame vinaigrette, and the tofu you can see in the background. Topped with bonito flakes, the 龍鬚菜 was tasty and fresh with a nice flavour in the sauce/dressing. The tofu was surprisingly heavy. I expected it to be one of those almost creamy types that fall apart when you try to use chopsticks to pick it up. Nope, not this one. It was dense, crumbly, and paired really well with the sesame sauce it was served with. Both really good, and I’d order both again. That egg. When I saw it, I smiled. I really like these kinds of egg. Poached slowly to allow the white to cook but the yolk to remain creamy and unctuous. Score. Known as ‘Hot Spring Egg’ it is traditionally cooked in Japan in hot spring water, sloooowly. I doubt that’s the cooking method here, but I really couldn’t care less. I effortlessly dispatched with the egg before stirring my noodles and reserving the chicken to eat as was presented. The spicy sauce hat quite a bit of minced meat inside, and was spicy, but the spice dissipated nicely and didn’t leave me clambering for the water. I wasn’t amazed by the dish, but I think at $150 it is very good value for money. Two shrimp and a big scallop make this dish stand out. The broth is the same flavour-packed chicken broth in the rice soup above. The noodles were cooked beautifully, and the flavours were all on-point making you want mouthful after mouthful. This was a hearty shrimp, plenty of meat, and a lovely fresh flavour. The scallop was served with the coral, otherwise known as the roe of the scallop. The scallop meat is chewy and tasty, but the coral adds a creamy texture that is just pure luxury. Bursting with flavour as you bite down, this is a winner. So, yes, it’s expensive. But, with only 10 bowls made per service, I would recommend trying. Good stuff, good stuff. On your recommendation, I hit 重熙老麵 today. Not a long wait, and well worth the price. Thanks for finding it! Glad to know you enjoyed it. What did you order? I got the chicken ramen soup, very basic dish but excellent. Yeh really basic, but totally on point.